All the herbs used in this blend were once primarily in ancient India and Africa to help relieve the symptoms of a “sluggish head”, commonly referring to people whose minds were stressed due to mental depression, grief, and lethargy. Ancient texts state that by burning this blend and inhaling its vapors, users would experience a sense of calm and deep relaxation. Also sold as an Herbal Smoke Blend called Ayurveda Burning Incense & Smoke Blend. 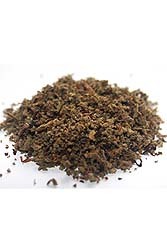 Ingredients: Pure shade dried herbs and herbal oils of White Lotus, gotu kola, Ginger, Sarpagandha, Wild lettuce leaves, Scull cap, Chamomile, Davana, Mullein, wild Dagga, Calamus, Catnip, Cistus Wormwood and a host of ayurveda herbs.